– A minimum visual segment during his final approach. 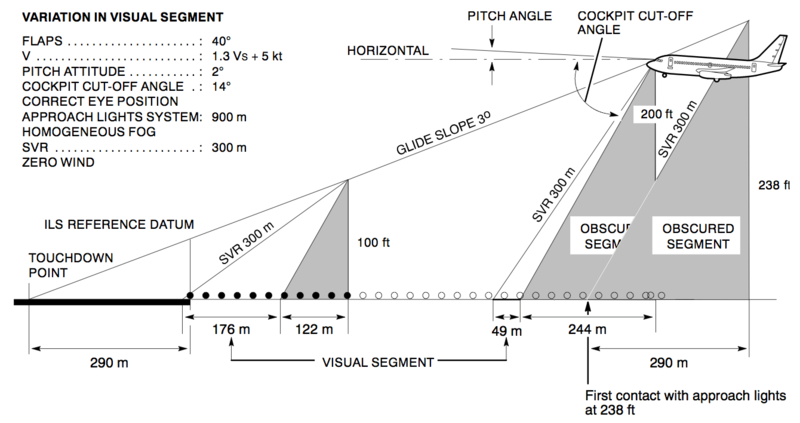 The exposure time depends on the decision height and the glide slope angle. From an altitude of 200 ft to the point where the runway threshold lights disappear from view under the bottom edge of the windscreen, takes from 10 to 12 seconds. At a 100 ft decision height the exposure time drops to between 3 to 5 seconds and it is more than likely that another two or three seconds will be spent integrating the visual cues. In this respect it should be noted that there is an inability of the human eye to instantly change from short range vision to long range vision and back again and a certain time lag should be taken into account. The present situation is such that a pilot can expect as many different combinations of glide slope angles and touch down point locations as there are ILS installations. If his decision height is 200 ft on 30 different approaches he can expect to see 30 variations in the view of the lighting system when reaching his decision height on each different approach. Though this does not make his task any easier, it can be appreciated that a difference of a second or so in a total exposure time of some 12 seconds is not critical. At a decision height of 100 ft however, the same variations in a total exposure time of some 3 seconds may well be vital! The ’visual segment’ is the length of the approach light pattern in view at any one instant of time. This is not the visibility or SVR. The SVR merely determines the distance between the pilot’s eye and the farthest light he can see, whilst the distance to the nearest light depends on the altitude and the cockpit cut-off angle. The distance between the nearest and the farthest lights visible is the visual segment, and a rough guide for the absolute minimum acceptable is a 150 m segment (5 lights) ahead of the aircraft. This is probably the minimum number which should be seen by the pilot to ensure that the lights have been correctly identified. It should be noted that, because the amount of obscured ground below the aircraft decreases as descent continues, provided the fog is homogeneous, the visual segment should gradually increase during the final approach, till at touch down it is almost equal to the RVR. Thus, a pilot can expect his visual segment to increase continually from the point at which he goes visual until touch down. However, most radiation fogs are comparatively shallow when forming and seldom extend to a height above 200 ft, so that a pilot flying in clear air above the fog top, and looking down through this layer, viewing the ground ahead just over the bottom of the windscreen, may well have quite a good visual segment. As the aircraft enters the fog top, the visual segment will decrease sharply and most or all the visual cues may be lost. This is an abnormal sequence! A non-homogeneous air mass or a patchy fog condition can produce a dangerous situation during the final portion of the approach. If the pilot, who has been in visual contact, suddenly flies into a thicker mass of fog or a ’blob’ of fog, the farthest lights of the approach light system or runway light system may well now be obscured. The rapid foreshortening of his visual segment, or his loss of visual cues, may immediately cause him to believe that the nose of the aircraft has been pitched up, obscuring the nearest two or three lights. In actual fact, the lights farthest away have been lost from view! The natural reaction is to lower the nose, thus increasing the rate of descent, and of course also increasing the chances of an undershoot. Once all of these factors and the destination weather are understood, the pilot will possess the knowledge to effect a safe and smooth transition from instruments to visual reference and a successful landing.